Unfortunately not. I paid him and I saw most of them cut in his shop but they have not been delivered yet. It’s the biggest order I’ve put in to date so i guess the tumble finish is slowing it down a bit. Got everything last Thursday. Now re-reading all instructions and Jeremy’s upgrade info in preparation for the upgrade. Thanks. Machine together. Tensioned. But lots of noise on left Y-Axis that I’m troubleshooting. I have the orginal X-Carve from 2015. Using original Nema 23 140Oz-in steppers and default 8x micro stepping,. Setting jumper to 4X on X and Y seems to do the trick. No vibration so far. Feed rate is a variable. No vibration at 60 in/min. Lots of vibration at 80 in/min. Continuing to experiment. If anyone has a sure fire way to eliminate vibration, let me know. Thanks. GeckoDrive drivers. 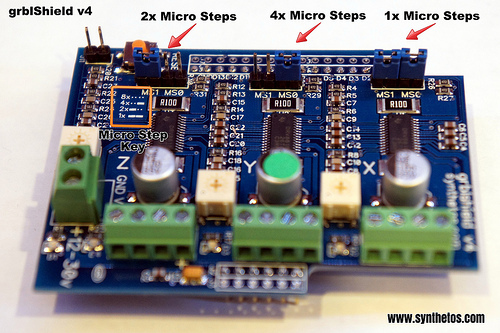 They use 10 microsteps, but I think that some of their drives will start at full step and morph into 10 microsteps. Thanks John. I’ll look into those. Did you have a particular model recommendation? There’s quite a range of prices and options. 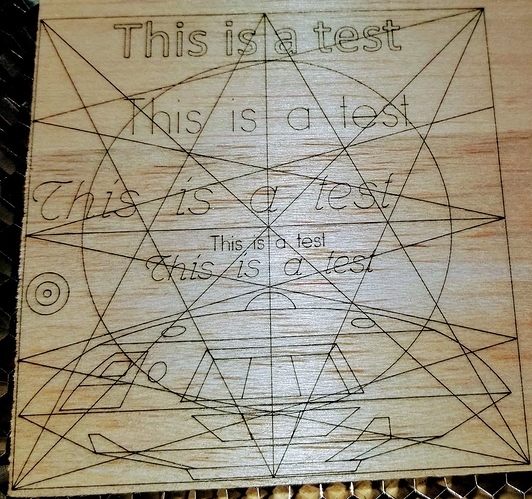 I’m going to start some laser etching today to test the lead screw upgrade in operation to isolate the range and settings over which vibration is not an issue. Then do the same with a 1/16 and 1/8 end mills. After fine tuning, I’ll determine if need to go the geckodrive route. Not having any issues with X-axis at 2x or 4x. I think best you contact Gecko for their recommendation. I own a few different models of their drives, and have never been disappointed with their use. Gecko has always been very supportive whenever I contacted them. Completed assembly and calibration. 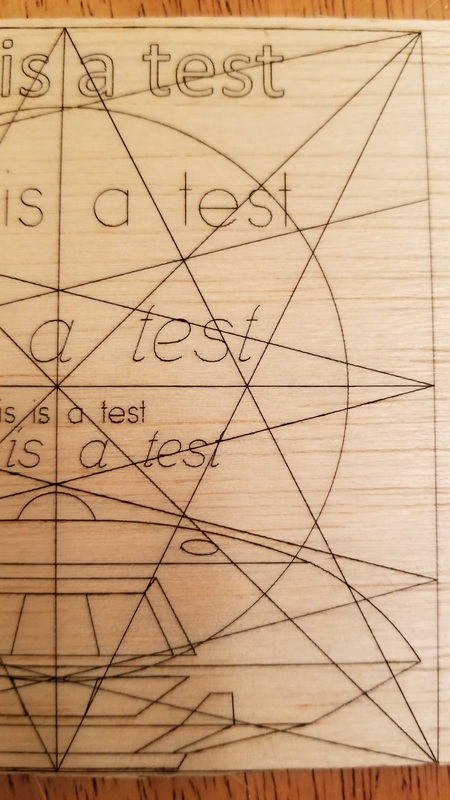 Left stepping at 4x for 1st laser etching test. (JTech Photonics 3.8 watt add on). Excellent results on test pattern! Rare resonance vibration when moving to start next etch in Y direction. (Will work that out). Etched at 50in/min. (Will try 60 next). Put my Y-axis steppers in the back (with $3=2). Everything still fits under my sound/exhaust dome (on a 4x4 table). 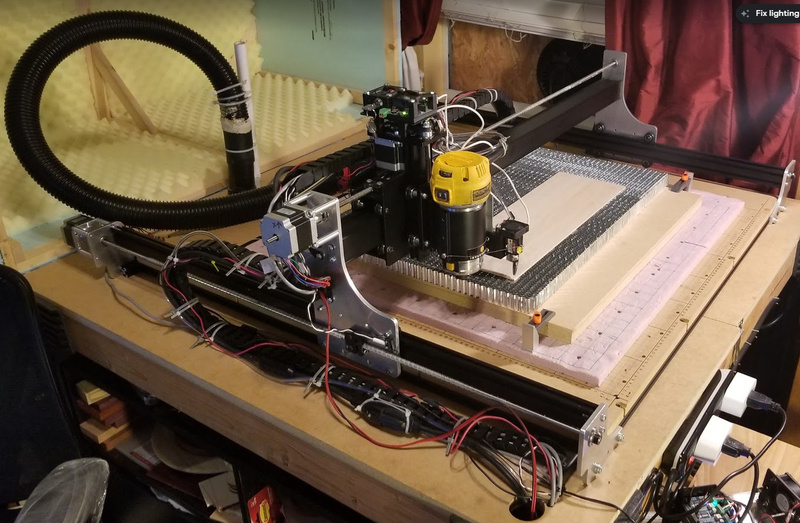 Probably going to get newer X-Carve drag chain (once I verify it works with ScrewDrive Upgrade and original X-Carve). Next going to make swappable 30x30x.75 MDF waist boards (to go on top of existing waistboard) to raise Z - one with holes, one with T-Slots. Also looking into upgrading from 3.8 watt JTech laser to 10 watt or more but early options expensive or too big (Opt Lasers or Endurance Lasers). What was the image you posted? It said something about a test? 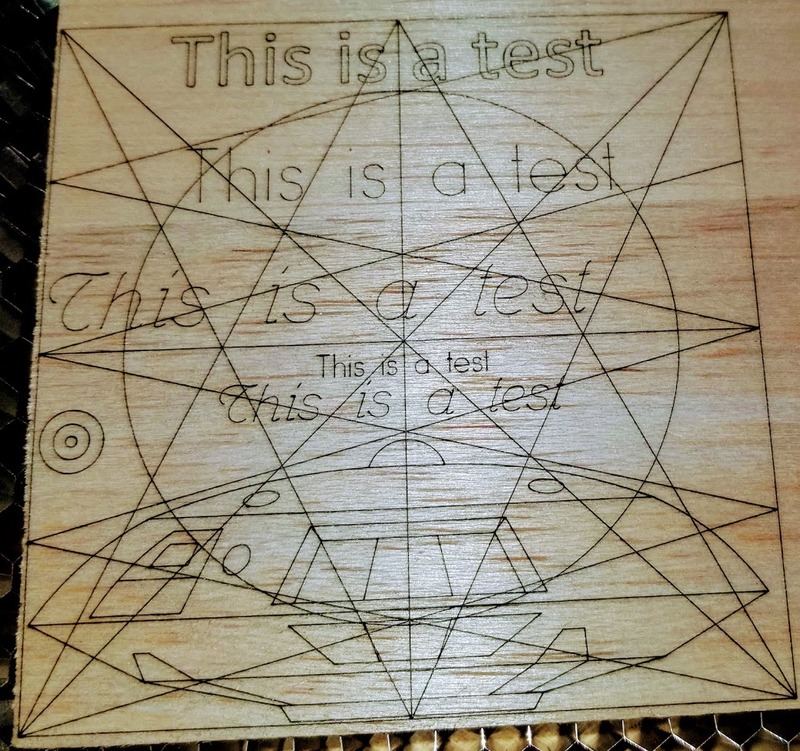 That’s a test pattern I created to test my Jtech Photonics 3.8 Watt laser add on (which I purchased soon after I bought the X-carve back in April of 2015). Jaggies that I couldn’t tune out were starting to appear. I was getting some very noticeable jaggies before the upgrade, which I concluded were a function of belt use, vibration and feed rate. 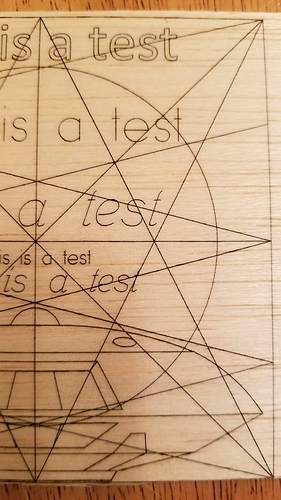 Laser very sensitive to vibration. Much better results with the ScrewDrive update (as shown in the 1st image above that you asked about). Able to increase feed rate from 30 in/min to 50 in/min almost no visible jaggies. (Which is the result I’d hoped for and driving reason for upgrade). Note the jaggies!!! You have to view image full size to see them. Was driving me nuts. Does anyone know what the diameter of the lead screws used is? Phantomm can correct me if I am wrong, but the standard diameter for these types of screws in the 3D/CNC domain are 8mm. OK thanks1 Will wait to see what CNC4Newbie uses. They claim 12mm. Correct. 12mm slide bearings. 8mm acme thread for power.